Clearblue Pregnancy Test with Weeks Indicator Reduced Price 1 test order online. It's like 2 tests in 1 - it first detects if the pregnancy hormone is present with over 99% accuracy from the day of your expected period, and if you are pregnant, it ALSO indicates how many weeks since conception occurred 1-2, 2-3 or more than 3 weeks (3+). The Weeks Indicator is 93% accurate in detecting when you conceived. The test is so sensitive you can test up to 5 days before your missed period*. 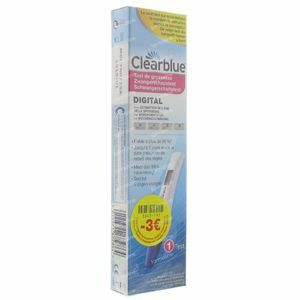 Wait for 3 minutes: After doing the Clearblue Pregnancy Test with Weeks Indicator an hour glass 'wait' symbol will flash to show that the test is working. When the wait symbol stops flashing your result will appear.